In this issue of Amazing Spider-Man, Peter still needs to run about and re-organize his life after having Doctor Octopus mess around with it. It's like: "Hey, Ock. You could have at least put everything back where you found it. -_-" But it makes for an interesting story to see the ways in which Peter puts his life in order. The writing is a lot more creative as compared to the issue where he lets the Avengers know that it's really him by saying: "Hey, guys. It's really me. [Insert funny quip.]" Avengers: "Oh, yes. It must be him." Note that that wasn't the exact dialogue, but pretty close. Peter also has to find a work-around so that he can still sneak off and do Spider-Man things without attracting attention. He can no longer work on Spider related projects at work so he's trying to find a cure for Electro. I enjoyed the moment where Peter comes to work and announces it's "Casual Friday." It's a small gesture to his employees to let them know that he's not a tyrant and he can relax a bit, too. Basically, he's not Otto. I'm, also, really interested to see if Peter will be able to find a new love life or not. He's letting go of MJ in this issue, letting her move on with a new boyfriend who happens to be a firefighter. Peter makes a strange observation. He notes how terrified MJ looked when it seemed uncertain if her boyfriend would be okay after making it out of a building fire. She must have looked like that so often when they were together and he was off trying to save everyone else as Spider-Man. Now that she's with a firefighter, she won't have to go through that... Yet she still does because a firefighter's job is still dangerous. The guy could get trapped in another building fire and what if there is no one around to help him? Yeah, Pete's a little too self-involved in his thinking at that moment. I think it's funny how he doesn't even stop to think about Carlie since he's thinking about the effect he had on MJ's life, but I guess "Out of sight. Out of mind." 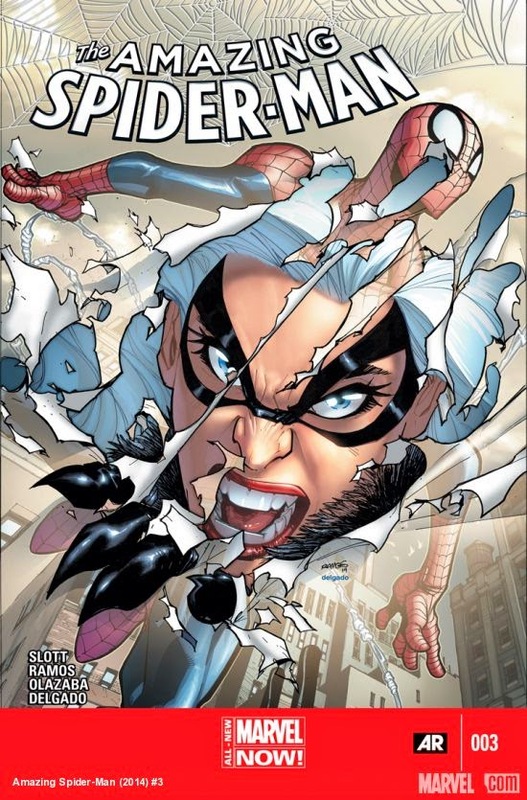 Black Cat is in this issue, too, and she confronts Spider-Man. She is extremely upset about their last encounter where it was Doc Ock Spidey who she mixed with (though she didn't know.) Spider-Man has got other things on his mind, so he doesn't spend too much time trying to talk sense into her. It's too bad for him because the end of the issue shows her teaming up with none other than Electro in order to get even with Spider-Man. I say good for Electro. It's time he got a little more to do than mope about after he was introduced into the story-line because of the Amazing Spider-Man 2 movie. All in all, I liked this issue. I liked the humor and the bits of action. And I liked seeing how Doc Ock's robot is still around. That thing has such funny sound effects. It's the little things like that which make this my Pick of the Week.